So, salad. It’s been a while. Unless you count the tortellini pesto pasta salad. I mean it was kind of a salad. Just not a green lettuce type of salad. But this salad – this salad – is one heck of a salad. And very good for you too. Right down to the healthy dressing that is a perfect complement to the spinach and the salad ingredients. And a great way to welcome in Spring. If Spring ever comes. It’s still in the 30 degree range where I’m at. Which is an improvement from last week…sooooo I’ll take it. But if the sun wants to show it’s smiley face sometime soon, I would be oh so happy! So yeah, the dressing. It’s only four ingredients. All good-for-you ingredients – olive oil, balsamic vinegar, honey, and some dijon mustard. Oh, and a squeeze of lemon if you want. I didn’t add that to the dressing though, just over the salad before the dressing was poured on. The rest of this salad is pretty straight forward – blueberries, sliced strawberries, and some peeled clementines are the fruity aspects. Then there are toasted almonds and feta cheese. And finally chicken. The almonds are sliced and toasted. I bought them sliced, but toasted them myself. Suuuuper easy. Just pour the almonds into a small skillet over medium heat and stir them around a bit until they are toasted to your liking. This adds so much flavor! You can leave out the nuts if you want, or try another nut. Pecans and walnuts come to mind for this salad, but I’m sure there are other nuts you could try too. The feta cheese tastes great with the berries and spinach salad. Again, you can definitely substitute a different cheese OR leave it out entirely if you don’t want it or have dietary restrictions. Finally, the chicken. I cooked the chicken on a skillet over medium heat with some olive oil, salt, pepper, and my favorite chicken seasoning – Mrs. Dash chicken grilling blends. SO good and adds a boat load of flavor to the chicken. I even sprinkled some of it over this salad. Instead of cooking the chicken over the skillet, you can grill it or even boil and shred it. However you like your chicken! You could even buy a rotisserie chicken and use that for the salad which we love to do. Or if you want to make this salad vegetarian, simply leave out the chicken. Prepare the fruits and lettuce by washing and completely drying. If the spinach is still wet it won't absorb the dressing very well. Remove strawberry stems and slice them. Remove clementine skins and separate into sections. OR drain a can of mandarine oranges. Remove fat from chicken. Sprinkle both sides of the chicken breast with salt, pepper, and Mrs. Dash chicken grilling blends to taste. Lightly coat a large skillet with 2 to 3 teaspoons olive oil. Preheat the skillet over medium-high heat until hot. Place the chicken in the skillet and then reduce the heat to medium and cook until the meat is no longer pink and the juices run clear, or about 8 to 12 minutes. As the chicken cooks, turn it occasionally so it browns evenly. If it starts to brown too quickly, reduce the heat to medium-low. Combine all of the dressing ingredients (olive oil, balsamic vinegar, Dijon mustard, and honey) into an airtight jar. Add some salt to taste. Shake until well combined. Toss the dressing with the spinach in a large bowl. Add in the fruit and feta cheese and toss again. If desired squeeze some fresh lemon over the salad. Toast the almonds in a small skillet over medium heat for about 1-2 minutes stirring constantly. Add the almonds to the salad. Once the chicken is finished, remove from heat and slice or chop it. Let it cool and then add it to the salad. If not enjoying immediately do not toss with the dressing or feta cheese! The colours in this salad is beautiful it’s making me excited for summer! I must try this fruit combo in a salad. Pinned! Oh man, this is MY kind of salad! Berries, almond and feta are pretty much one of the greatest combinations EVA! Now I just need to convince the husband to eat green things! Thanks for the pin Taylor! Now this is quite a beauty! It looks almost like a work of art. That dressing sounds perfect in all its simplicity. Well, now I know what my lunches next week will consist of! Talk about gorgeous! These photos! I looveeee salads with fruit and even the fiancé asked for them! I will be making this next week for sure! Thanks, Chelsea! 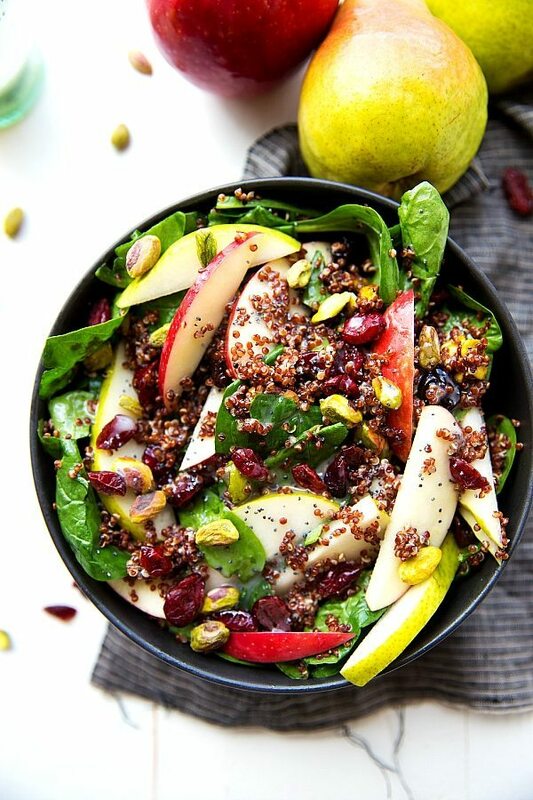 I adore the colors on this salad,so energizing. Your pictures are gorgeous. The colors in the salad are beautiful and it looks perfect! You are so sweet! Thank you Chloe!! We had snow flurries all day so definitely not feeling like Spring! Haha definitely hoping its right around the corner! Ohhh I do love this! Great minds think alike Chelsea! I posted something so similar to this 😉 Colorful fruity salads are the BEST. Love your pictures as always, awesome food styling! Soooo happy it’s finally officially Spring tomorrow, thank goodness!! Totally on the same food wave length! Your salad is gorgeous lady! Chelsea, these fruits look so vibrant and gorgeous!! I LOVE this salad!! Haha!! Totally on board with pretending it’s Spring and having that happen – if only!! I can’t wait to dive head first into salads like this! Salads loaded with fruit, nuts, and grilled chicken are my favorite when the temperature rises. I will have you know my two year old son is sitting next to me saying “yummy, yummy, yummy” He thinks this looks pretty fantastic too! Thank you Kathi and thanks for the pin!! This looks like Spring in a bowl! If the weather won’t cooperate – and it doesn’t appear that it will any time soon! – I’ll gladly take this version! Haha seriously! Ohio’s weather – unbelievable!! Oh wow – this looks like the most perfect spring salad ever! And the pictures are beyond gorgeous: they make me want to pin this 24850495 times! I love berries in my salads! And they taste so great with feta and almonds! What a perfect salad – and your photos look so gorgeous! That bowl of strawberries is calling my name! Pinning! Mmmm this is exactly my kind of salad!! Now if only berries would come back in season!! I can’t wait for that … the last few weeks it’s been a toss up if they are okay or not at the store! This salad is just beautiful! 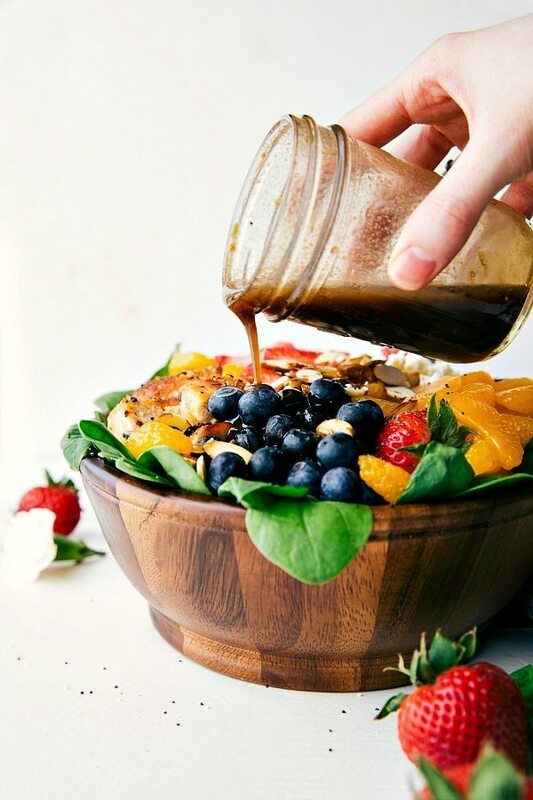 I go crazy over pretty food, and I’m loving your salad dressing! Pinned! This looks amazing. I can’t wait to try it! Pinned! Love salads, and this one looks delicious with all the fresh fruit and almonds. Love it! Pinned and will be trying this soon. Thanks! Wow! Now this is my kind of salad! Love fruit in my salads then add the chicken for a little protein and I’m one happy camper! The photos are gorgeous Chelsea and I so want that honeycomb thing! Pinned, thanks for sharing at Show Stopper! What a GORGEOUS salad! I can’t wait for some fresh fruit to hit the produce section of my grocery store. YUM! Found you via the Two Cup Tuesday Link Party. This post has been Stumbled and Pinned! This looks like a perfect salad. I love salad but am always looking for new ideas , so thanks for sharing. This looks so delicious and it’s so healthy and easy to make. Saw your recipe at the Simple Supper Tuesday party :). What a beautifully colourful salad. Thank you for sharing at Simple Supper. This salad does look beautiful & I’m sure it is tasty, too! Gorgeous salad and exactly what I’m craving after the Thanksgiving carb overload. Thanks Andrew! Hope you love it! These salads look so fresh and delicious!!! I just can’t wait trying them!! This salad is so good I could eat it every day! I made it for my co-worker and I. We both loved it. I’ve always been weird about mixing my sweet fruits or berries with greens and savory. I don’t know why, but I’ve always been afraid to try it. This salad is so incredibly gorgeous, you have convinced me to give this a try! I’ve got it planned for lunch next week! This salad is one of my family’s very favorites, even our 7 and 4 year old love it?? It’s so good I’m even making it for company today.